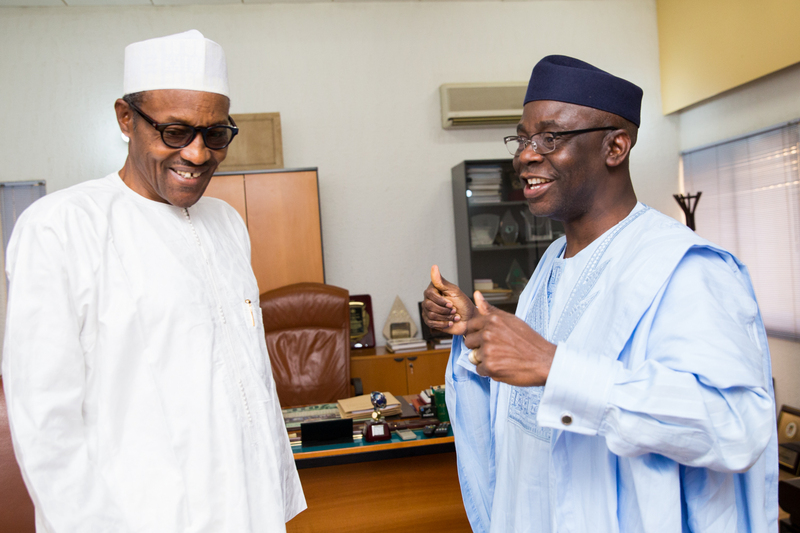 The Presidency has stated that contrary to media reports, Pastor Tunde Bakare of Latter Rain Assembly and Minister of Finance, Mrs. Kemi Adeosun, did not meet with President Muhammadu Buhari at State House, Abuja, on Friday. Tunde Bakare and Adeosun had been were seen entering the President’s office at about 2.30 p.m., on Friday. Dressed in agbada, the cleric clutched a black bag walking side by side Adeosun and both were engaged in a discussion. While Bakare left the Presidential Villa around 4:00p.m., Adeosun left at 4:35p.m. Bakare had said on his way out that they both met at the entrance of the Villa and that their visit was not related. Special Adviser to the President on Media and Publicity, Femi Adesina, in a statement explained that, “The Minister was at the Presidential Villa in connection with the Annual General Meeting and 25th Anniversary Celebration of African Export-Import Bank (AFREXIMBANK) holding, on Saturday, in Abuja, which would be graced by President Muhammadu Buhari. “Mrs. Adeosun had seen President Buhari not fewer than three times earlier in the week, and did not need to meet with him again on Friday. Bakare also in his reaction said, “The story published by some social and print media today is both cheap and sensational journalism. “Hon. Min. Kemi Adeosun and I arrived at the Villa at different times. We met at the corridor. She went on to see someone else in the Villa and I went into a closed door meeting with PMB alone to thank him for sending a powerful delegation to my mother’s Home-going Celebration. “This is the truth. The impression being created is as if she ran to me to speak to the President on her behalf. This impression is erroneous and false. I will appreciate that my side of the story is also published. Many Thanks. Tunde Bakare”. The former running mate to President Buhari as then presidential candidate under the defunct Congress for Progressive Change (CPC) had recently chastised the president over the worsening economic and security situation in the country. An online newspaper, Premium Times, recently reported that the minister of finance submitted a forged NYSC exemption certificate for her ministerial screening when she was not eligible to have one having graduated at the age of 22. To be eligible to be issued the certificate, the applicant must have graduated at the age of 30 and above. The NYSC which confirmed that she applied for an exemption certificate had, however, promised to investigate the one in her possession.